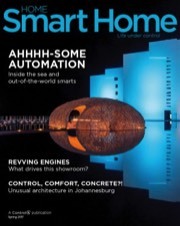 Digital Smart Homes is a small company that is growing fast and strives to be on the cutting edge of technology. Come grow with us and work in a fast paced, stimulating, and friendly environment. MUST have a variety of commercial contacts. Are you an expert with Commercial Audio Video systems? Do you have a sales background and a professional demeanour? If so then read on! We are a Electronics Systems and A/V Technology Firm seeking an Outside Sales associate to generate and follow up on leads as well as maintain our database and assist with marketing. To be considered for this growth opportunity: You MUST have experience selling commercial AV systems. We are not considering any other backgrounds. Establish new accounts by planning and organizing daily work schedule to call on existing or potential sales outlets and other trade factors. Meet with prospective clients in our showroom or their office or home, educate & explain the options that exist that meets their needs and budget. Maintains professional and technical knowledge by attending educational workshops, reviewing professional publications, establishing personal and professional networks. People who thrive with us are self-motivated, organized, and adaptive. Most importantly, they possess a fanatical dedication for delivering great solutions for our customer. Working with the best brings out the best in you, and exposes you to new challenges and opportunities you may never have imagined.